When I awoke it was already bright. Rolling over to find my phone and check the time took a bit more effort than it had the day before. All of my muscles were letting me know that the previous day had been a big one. 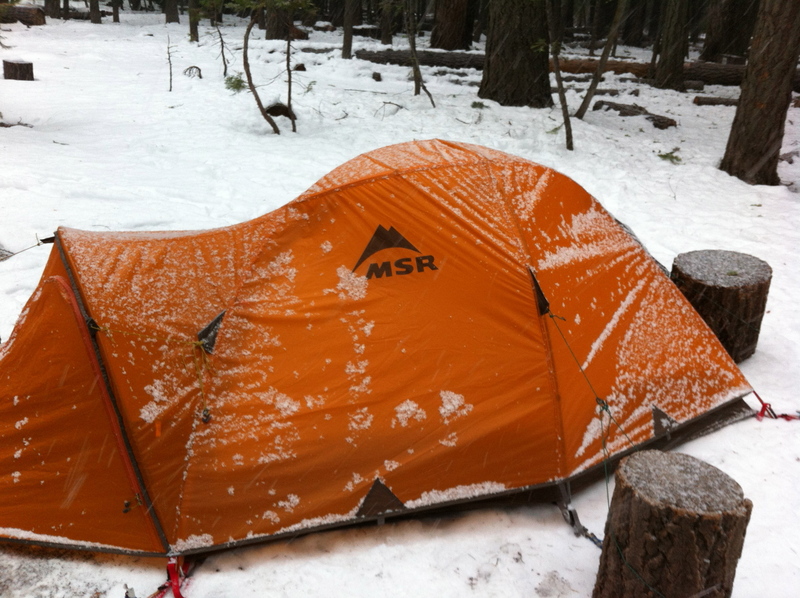 It was about 9:30AM, the wind was blowing and I couldn’t tell if the snow hitting the tent was fresh falling or just being blow from its resting place on the hillside. Between the wind and my stiff muscles, I wasn’t in a hurry to get up. There was no need to hurry either. There was no big summit or target to get to today. The idea was to just wander out along the ridge and turn around at some point to make camp at Dollar Lake. I climbed out of the tent to a clear sky, but it was much cooler and windier than the day before. 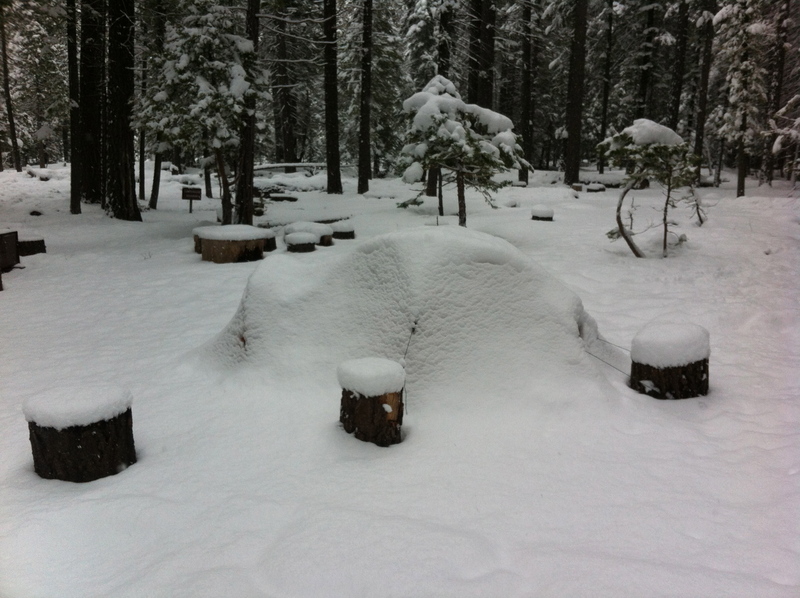 Paul and I found shelter behind a large log to make breakfast and decide where we were going to hike to. Since both of us were feeling the effects of a long summit day, we decided to take a nice easy hike down to Dollar Lake. It was only 1.5 miles away and about 800 feet lower in elevation so it should be warmer and more sheltered from the wind. It was 11AM by the time we had camp packed up and were ready to take off down the mountain. The start of the trail was in the shadow of the ridge and had a strong wind blowing up the slope… and with out previous tracks we again found ourselves post-holing through knee-deep snow. Today, however, this didn’t last long. 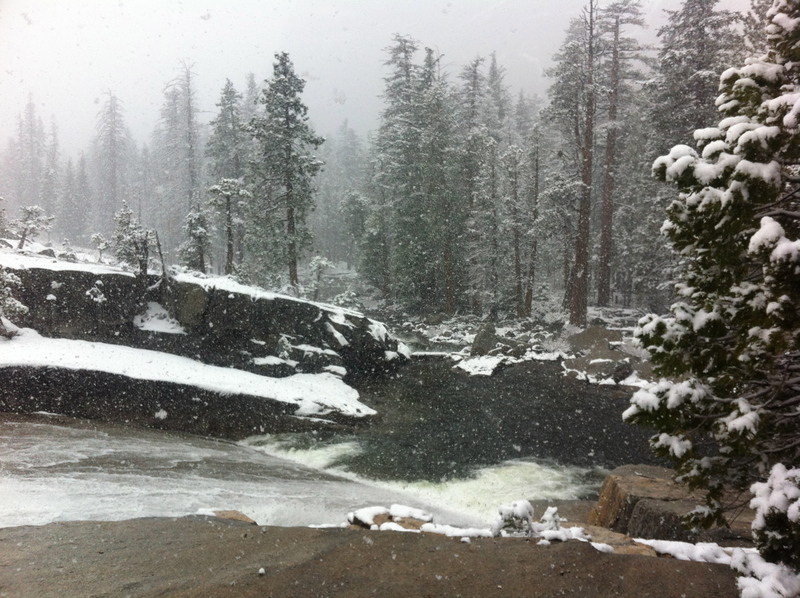 The snow level decreased and the temperature increased quickly as we descended. 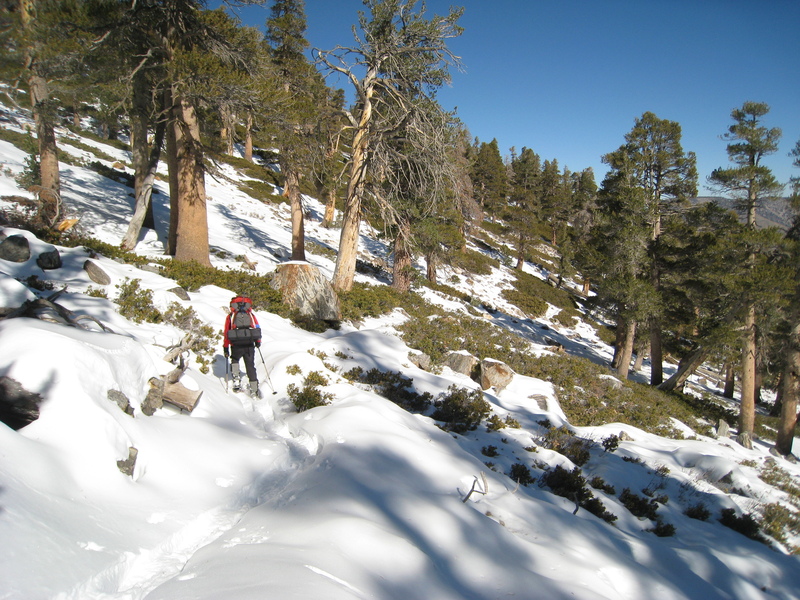 Once we crossed into the sun, the snow depth had decreased significantly and we quickly came to the trail intersection that would take us to Dollar Lake. We had traveled quickly and it wasn’t even noon. 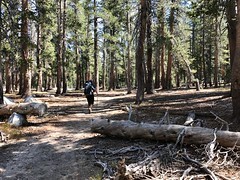 Looking down the Dollar Lake trail, we noticed that we would most likely be building camp in the shade. 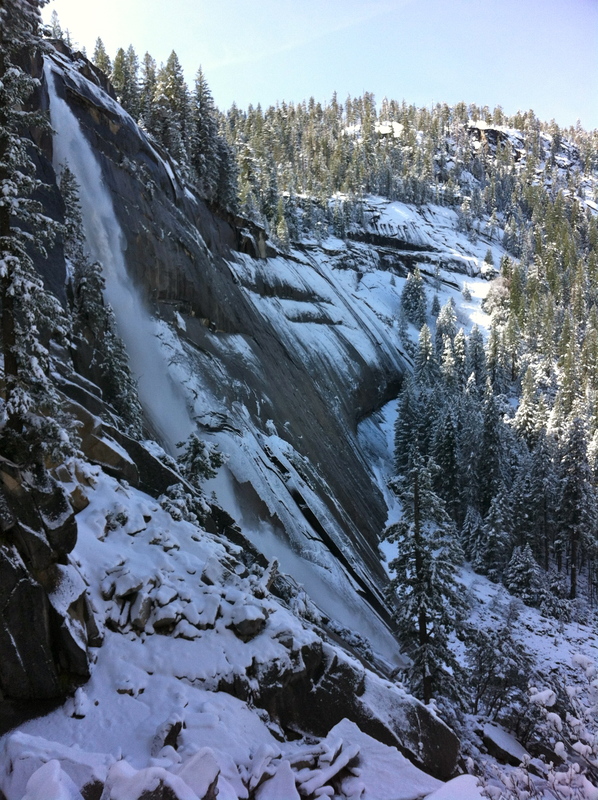 And without a lot of side hiking opportunities or desire, this looked like a cold way to spend an afternoon. After a little discussion, we decided to go ahead and return to the car which would give us two days back in Berkeley to clean gear and recover before having to return to reality and the lab… so we continued downward. 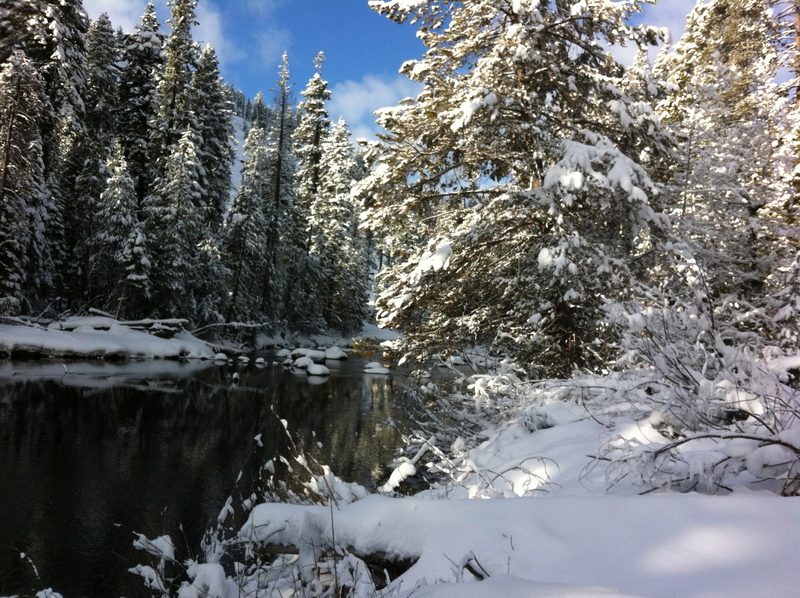 As we descended, the snow cover continued to decrease and we stopped to take off the snowshoes. That made the pack a bit heavier, and I stumbled over my first few steps while my body remembered what it was like to walk without these large flat things attached to my feet. But after a few steps I had learned to walk again, and our pace picked up significantly. It was yet another beautiful day for a hike! 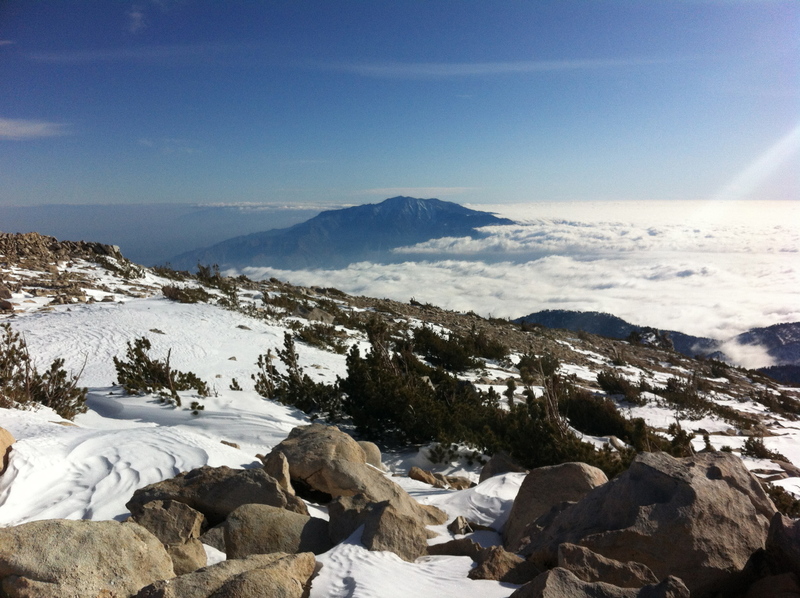 Looking back at the summit of San Gorgonio on the descent. 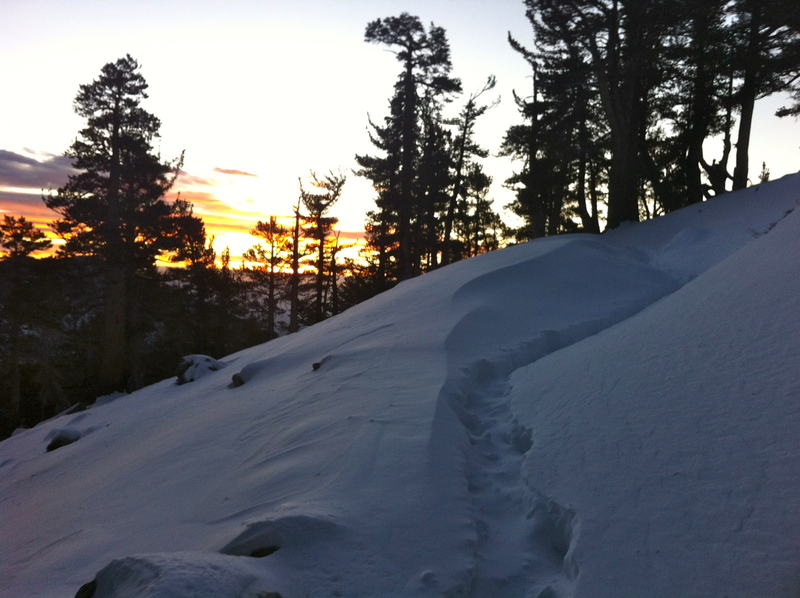 About halfway down the trail, we rounded a corner and came up on a set of foot prints in what remained of the snow. We were no longer going to be putting in first tracks. Though we had yet to find a person to go with those tracks, I was suddenly reminded that we were in fact on a fairly well traveled trail and no longer felt so removed from civilization. After a bit further, we came up on Richard. He was a volunteer park ranger (as many rangers in CA are now due to budget cuts) out on a day hike towards Dollar Lake. 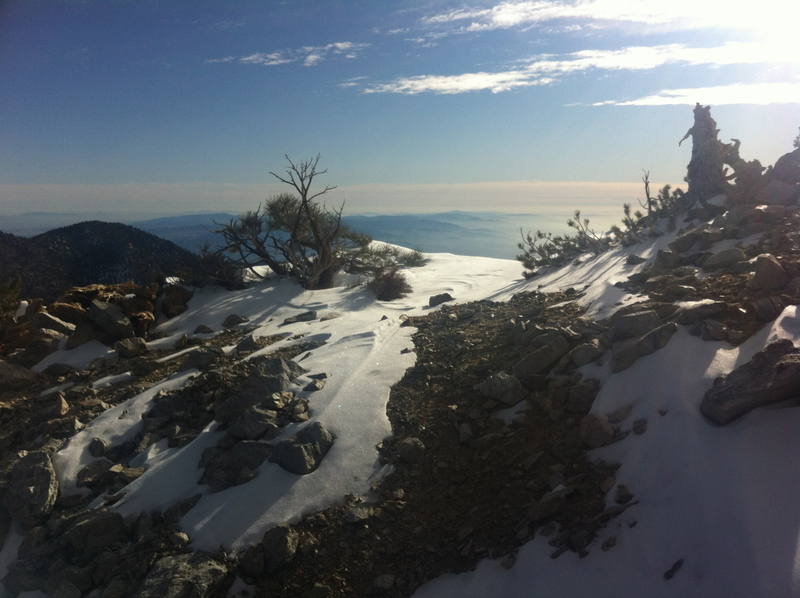 He told us stories of people he runs into with tennis shoes and a single bottle of water with the idea that they would make it to the summit and back in the snow. We had a few laughs about this, then showed him our permit and continued on. A little while later I hear Paul laugh behind me… I look back and he says, “You know what I just realized? We just met Ranger Rick!” HA! 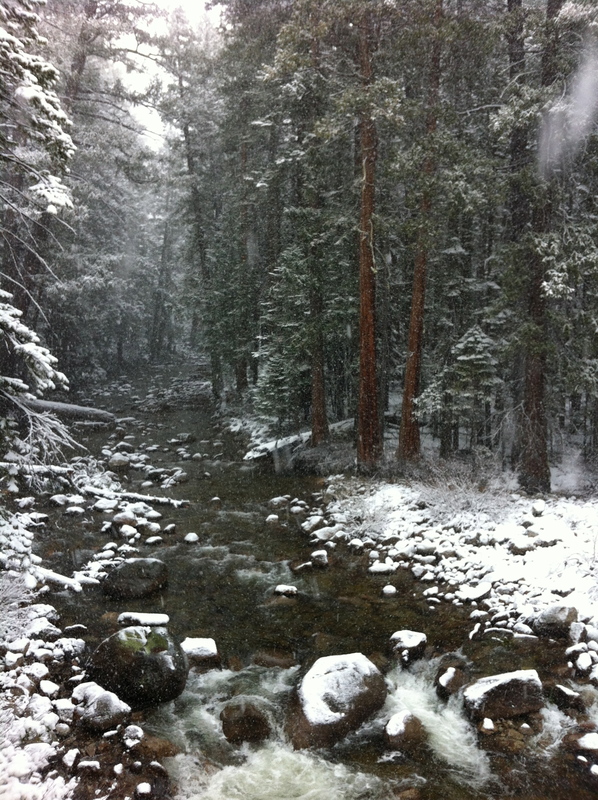 Meeting up with the South Fork trail that our journey began on, we stopped at a stream crossing to fill our bottles. 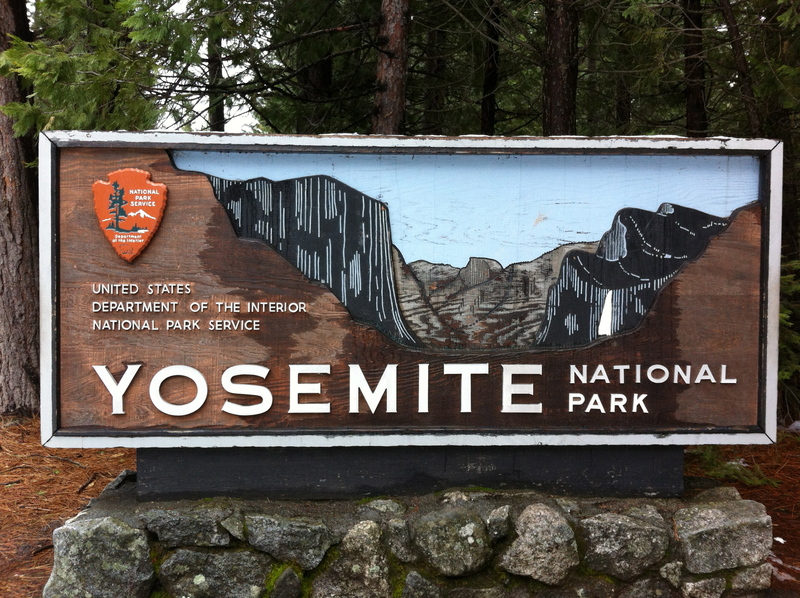 This was much faster than melting snow for water… MUCH FASTER! I filled and emptied my bottle a few times and watched as the water rushed in to fill it with a strange feeling of amazement in how quickly the stream would fill it. Here we met two guys that were heading up to the summit via Dollar Lake taking the reverse trip we had just done. 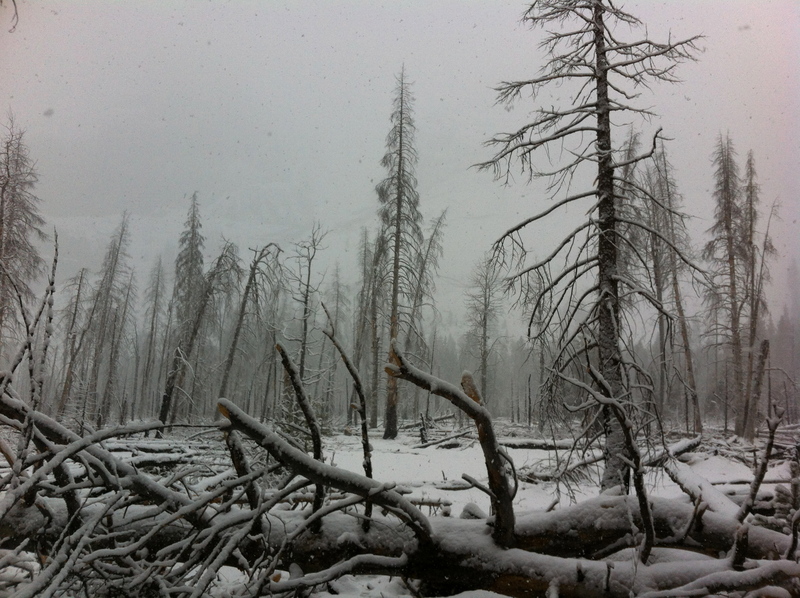 They didn’t have snowshoes, but seemed unconcerned when we told them the snow conditions we had just stomped through. By 2PM we had made it back to the car! 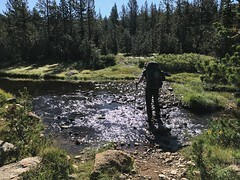 My body was thrilled to put down my pack and my feet happy to get out of my boots. 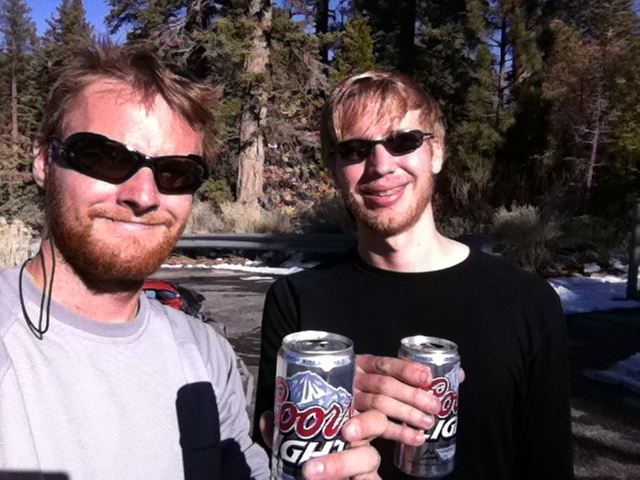 Siting on the bumper, I thought back to the many trips I took during my time with the outdoor program in college, and remembered a few words of wisdom, “The trip’s not over until you’re drinking beers at the car.” The summit day on San Gorgonio was proof to that. The summit had been reached the previous day, but there was still much to push through to make it a successful summit trip. Now that we were back at the car, it was time for that victory beer! The app worked great! The GPS was able to pinpoint our location to within 8 feet of where we actually were. 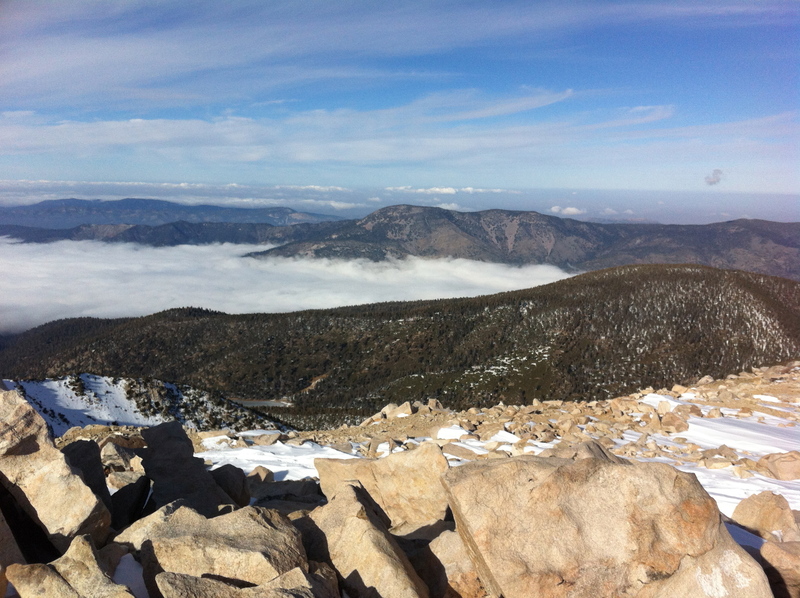 Where its benefits were most appreciated though, were above tree line. Following the trail within the cover of trees was not very challenging. For the most part we just followed the widest path between trees, and confirmed it was the trail by looking for signs of trail maintenance (most notably branches and logs cut by saws). 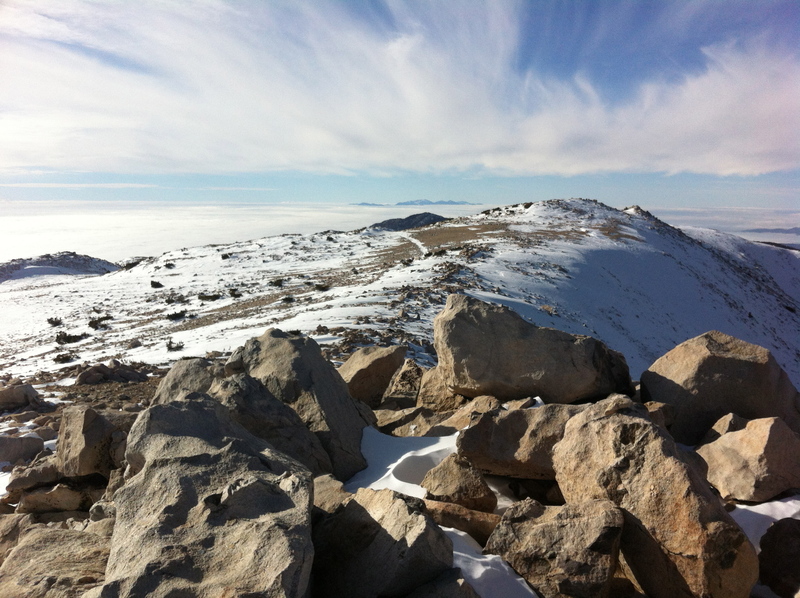 But above tree line we had to rely on stacks of rocks that were, for the most part, covered in snow. 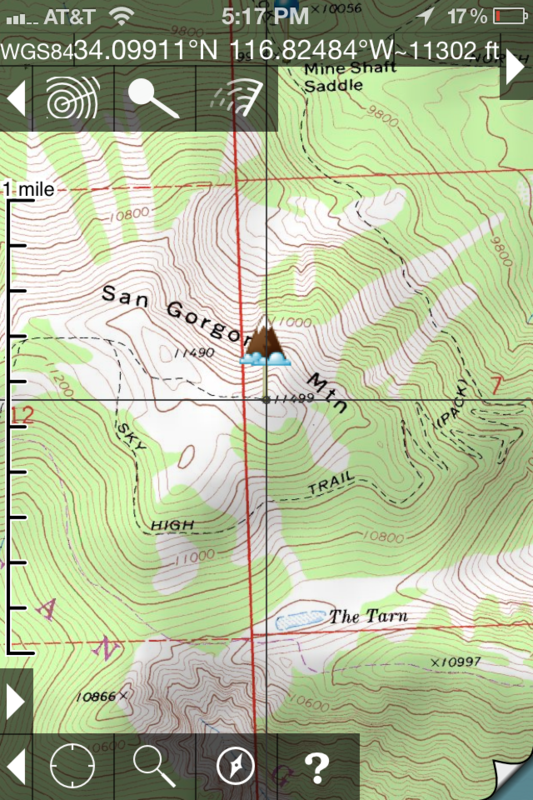 With the help of GPS, staying on the trail above tree line was trivial. However, since I also use my phone as my primary camera to get the GPS tags on all the photos I take, there became an issue with battery life. How would I keep the notoriously short lived iPhone battery charged for several days while routinely using the GPS? For that I turned to the sun. 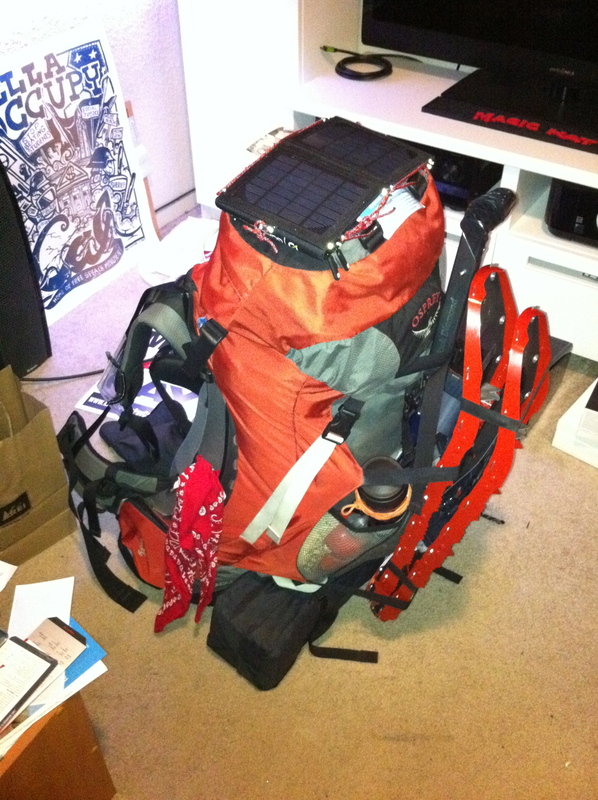 I picked up a solar charger from Goal Zero and strapped it to the top of my pack. This kept my phone charged and ready to go for the duration of the trip! Day 2 started early. My alarm woke me at the lovely hour of 3AM. I woke surprisingly quickly. It may have been due to the 6PM bed time the night before, or maybe the adrenaline of knowing it was time to climb the mountain. 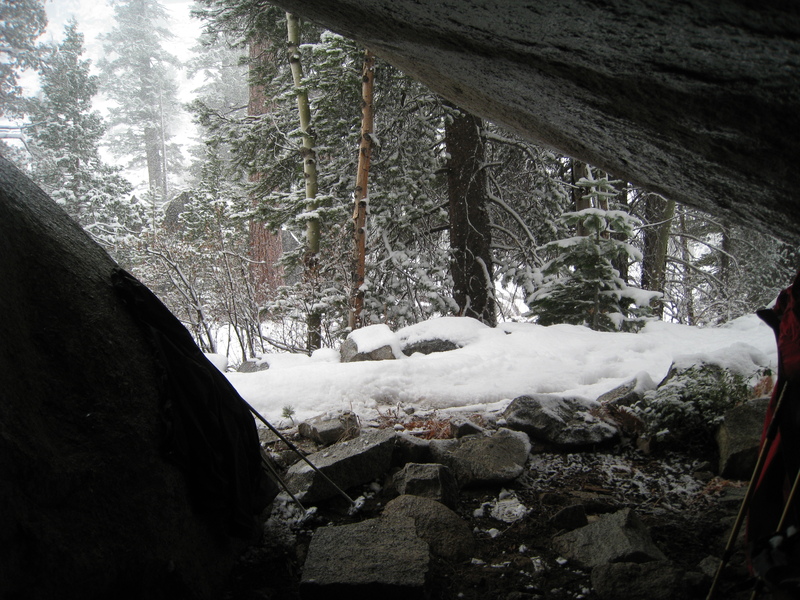 The weather forecast had said there would be a 30% chance of snow this day, and I was worried about opening the tent to find ourselves socked in by clouds. 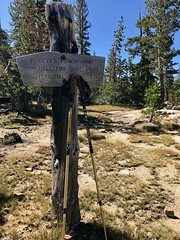 With no idea how far the tracks continued up the trail, I feared the idea of having to route find with limited visibility… this would most likely have put an end to our summit dreams. 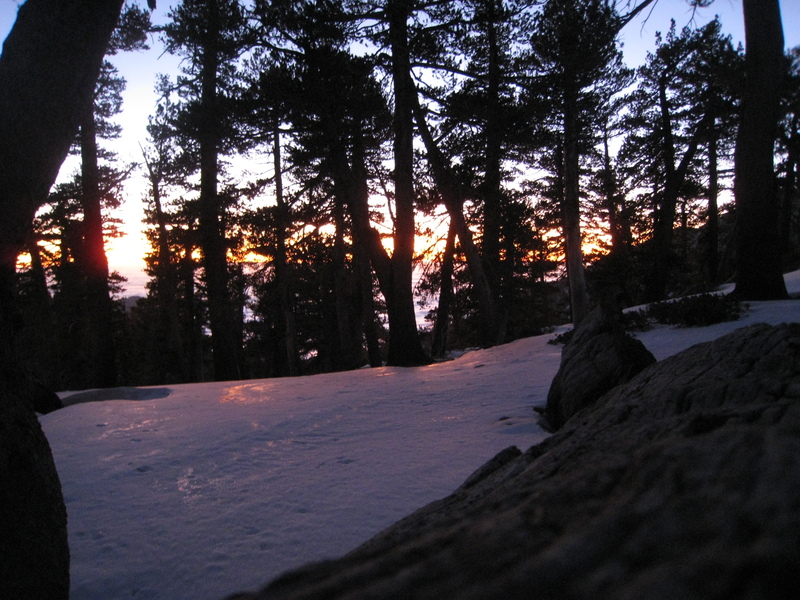 I opened the tent to find it darker than dark outside as we were going to be under a new moon for our pre-dawn hike. 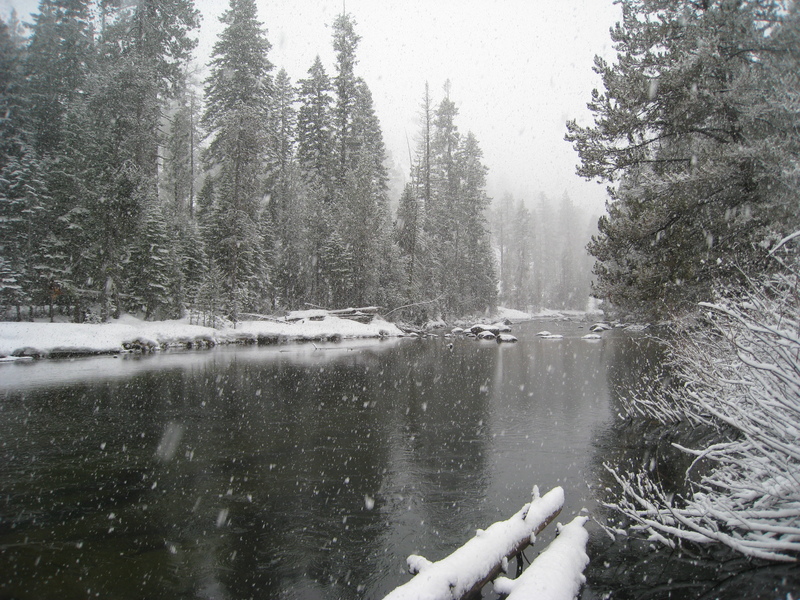 The air was still and there were no snow flakes falling from the sky above. Looking up, I saw a sky that was crystal clear and full of tiny points of light (many more than visible from the sky of the Bay Area). This was definitely a relief. 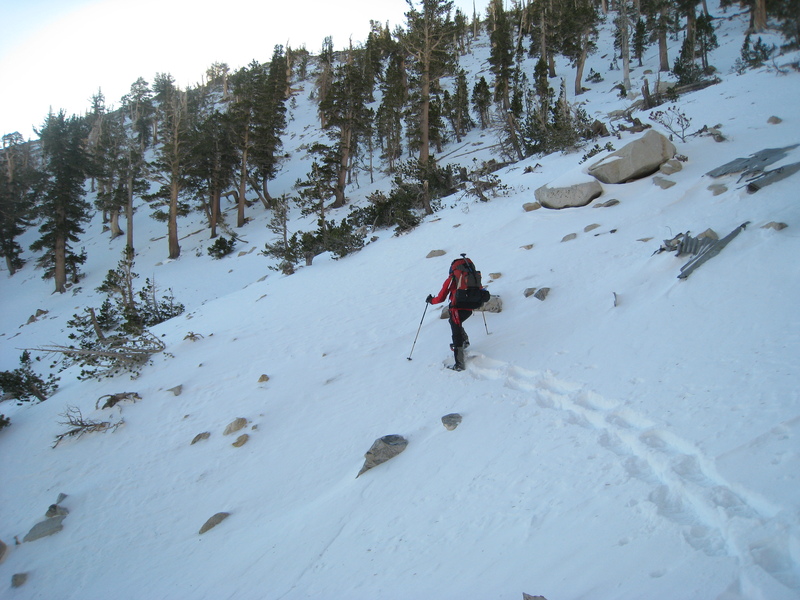 After packing up camp and strapping on our snow shoes, we headed up the trail towards Mineshaft Saddle. We got on the trail by 4AM, and with the saddle about 2 miles away, we figured we would get there by sunrise. 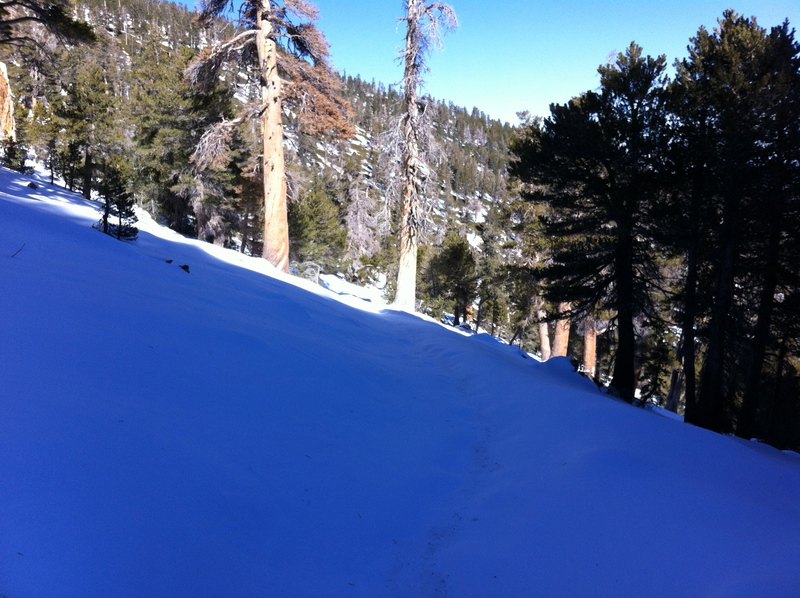 As we hiked, it became clear that we were following only one set of tracks… those belonging to our trail blog friend who had turned back only 2 days earlier. I was happy to have a clear trail in front of me. 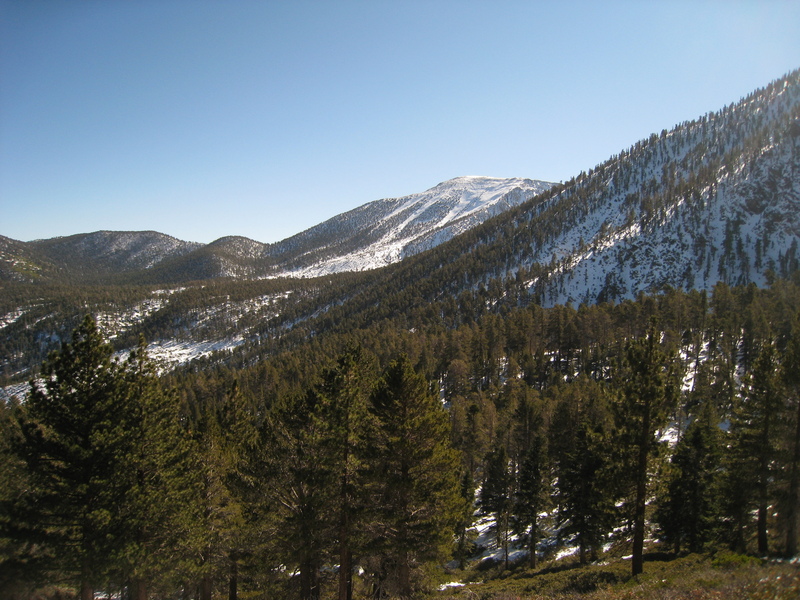 As we approached the saddle, a dim glow appeared over the ridge. I was happy to see morning arrive, and the saddle provided the perfect vantage point to watch the new day begin! On the saddle, our trail intersected with Fish Creek Trail. There were no tracks coming up that trail, and the ones we were following continued up the mountain. 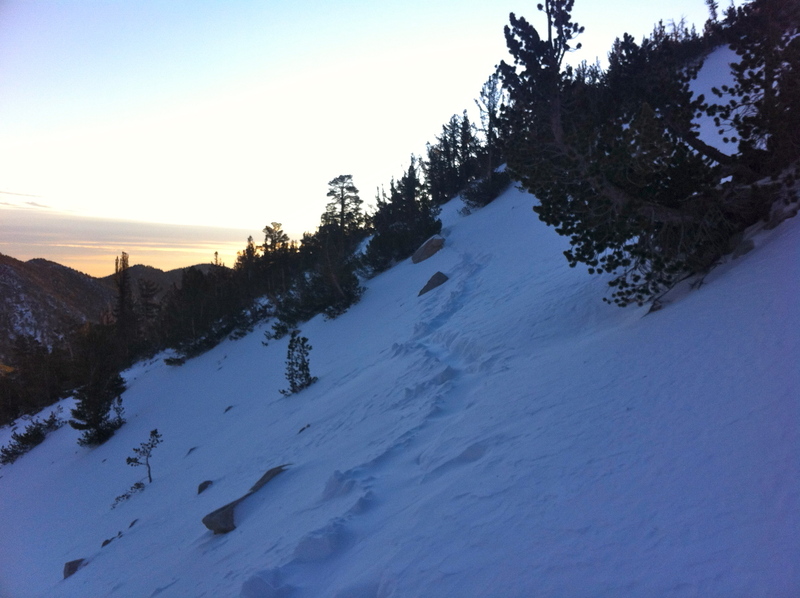 While the air was still, the trail showed evidence that we had crossed over to the windy side of the mountain. The tracks had begun to be filled by drift snow traveling across the slopes, and the snow was consistently over a foot deep. 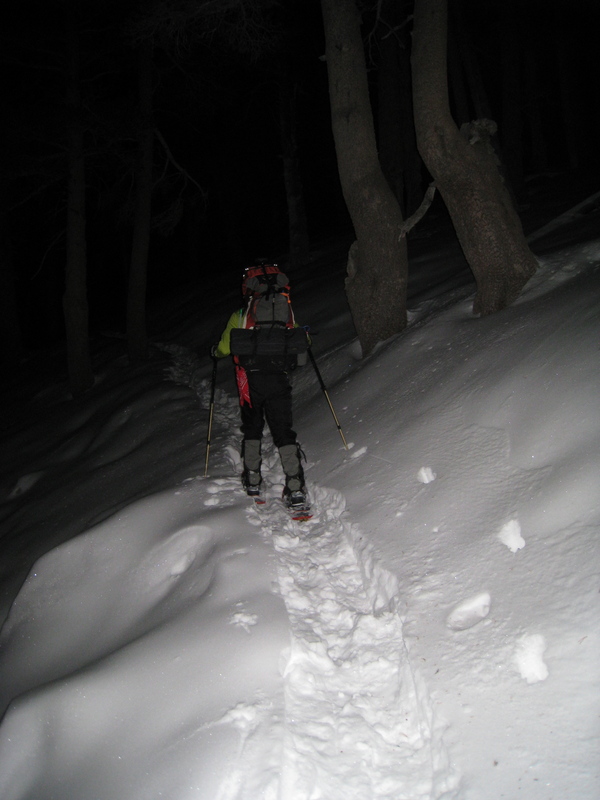 Continuing on, the slops continued to get steeper while the tracks we were following continued to disappear. As we followed the ever diminishing trail, a few gentle breezes started passing through. They were gentle and surprisingly warm… I enjoyed the feel of the warm air on my face, but hoped the winds would not pick up or bring the snow that had been forecast. As we approached the beginning of the switchbacks, we came up to the site of the 1953 plane crash. 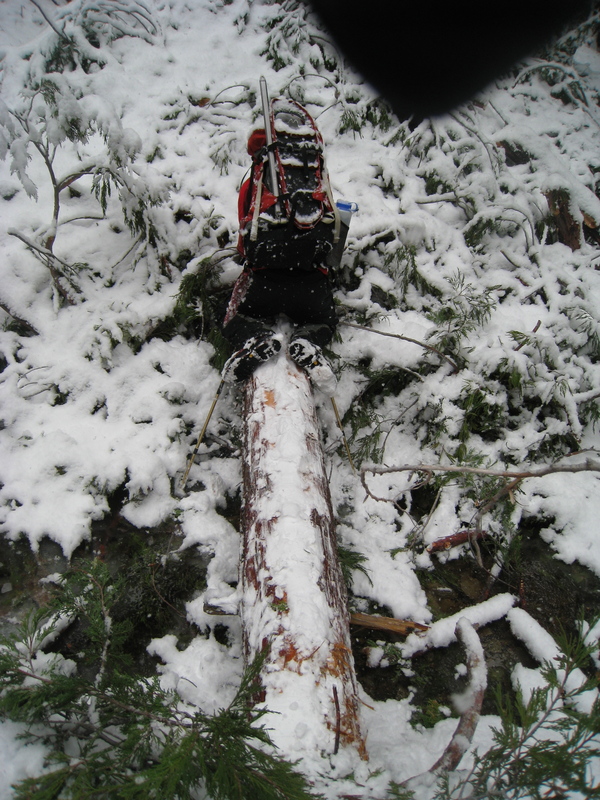 The wreck had been mostly covered, but there were a few pieces still visible through the snow. This was also the point where our trail disappeared into the powder. We had reach the point at which our blogger had turned back. I could see the switchbacks weaving their way up the slope and began wondering how far we would get. It was still fairly easy to kick steps in the snow with my snowshoes, but for how long would this be true? There is of course only one way to find out, and with a beautiful, clear sky above us, we continued onward and upward! The switchbacks presented quite a challenge. 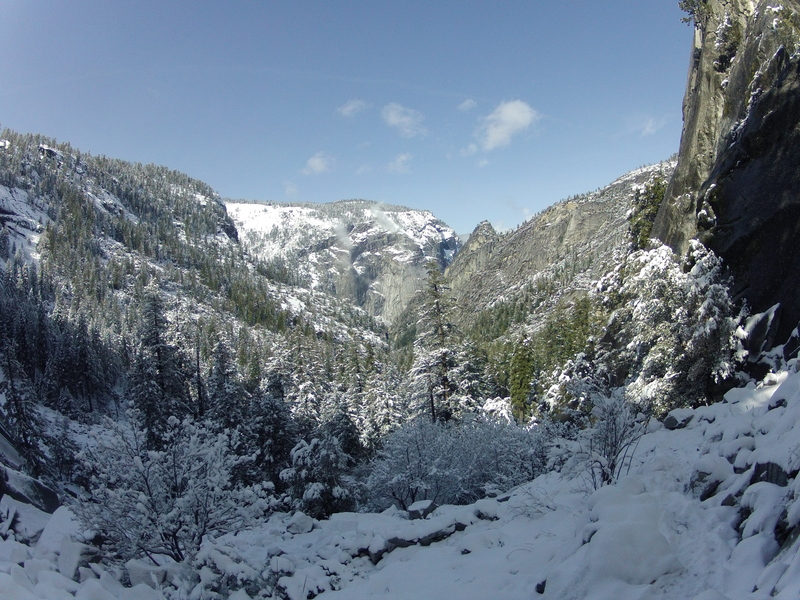 While the trail was easy to follow through the trees, marked by evidence of trail maintenance, gaining about 1,000 feet in such a short distance is never easy… especially when shuffling through over a foot of snow. Our efforts were well rewarded. 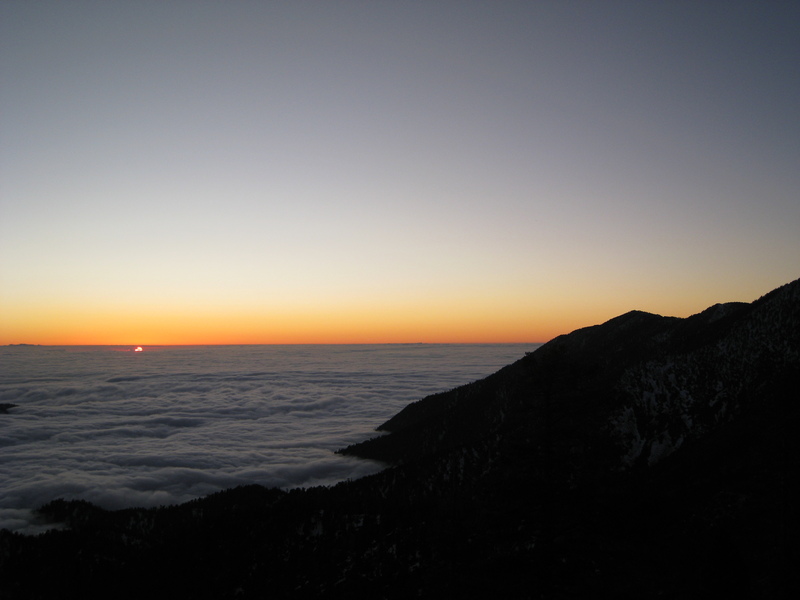 After no fewer than 8 switchbacks, we crested the ridge into the warmth of the ever rising sun to see the valley below to the east and a low lying blanket of clouds to the west. It was now approaching noon and we were within 2 miles of the summit. We estimated that we were about 30 min behind our expected pace, but after getting a quick lunch and checking the map, we continued on to the summit. As we pushed along the last bit of trail to the summit, I could feel the air getting thinner while my feet seemed to get heavier. Coming around the mountain allowed us to see the extent of the trail. 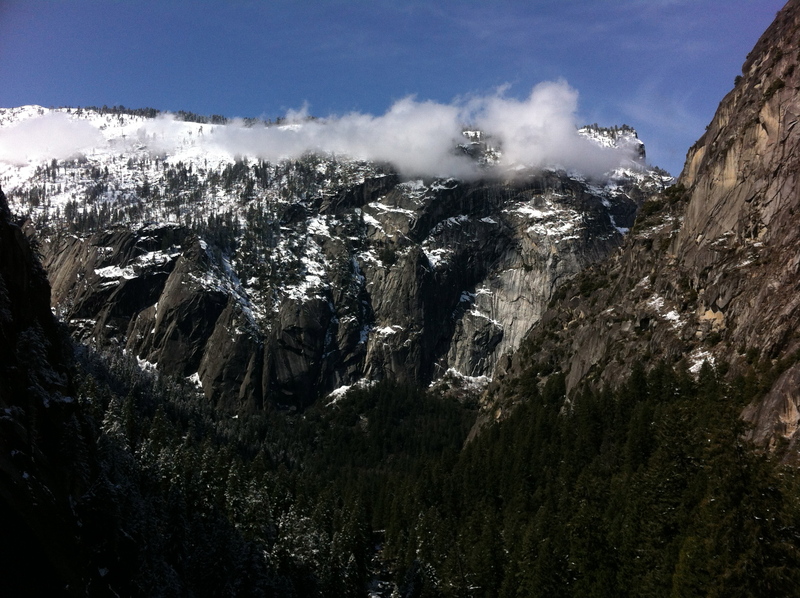 It looked like a white carpet gradually sloping upward along the ridge. I knew somewhere out there was the trail junction that would take us up to the summit. Now that it was in sight, it seemed so close, but as my legs grew more tired, and my lungs had to work ever harder to get oxygen from thinning air, it seemed so far away. 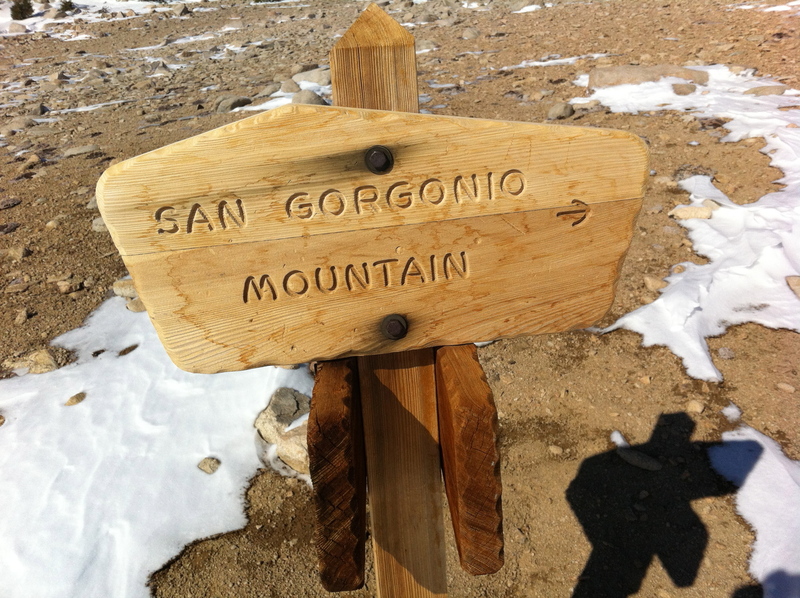 Then I saw it… the trail sign pointing towards the summit! It was now almost 1:30PM and we had been hiking for over 9 hours. 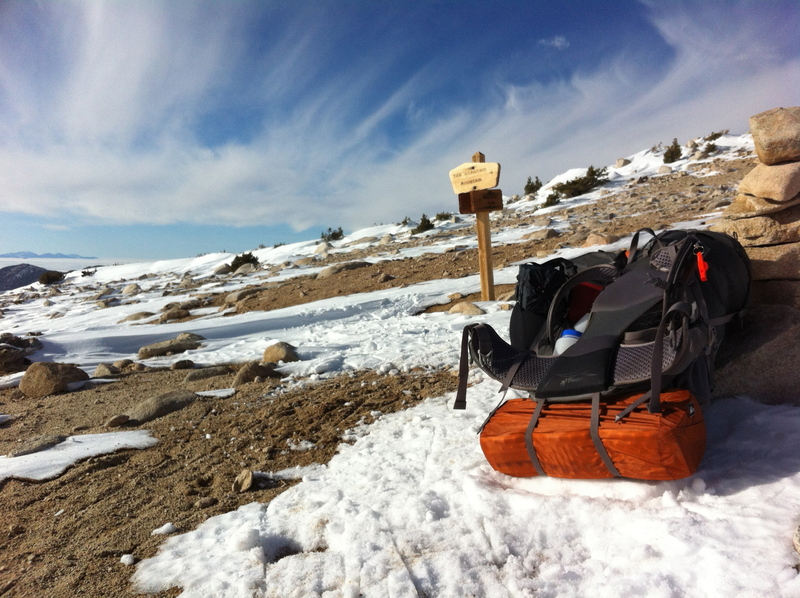 We dropped our packs to make a quick detour to the summit… half mile out, half mile back. 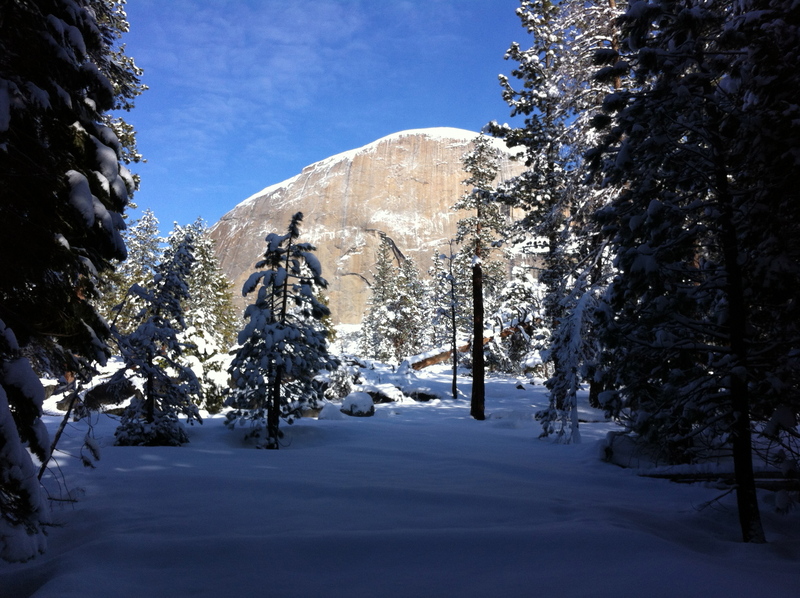 We had made it… and what a way to spend Thanksgiving! After celebrating a bit on the summit (11,501 feet), and enjoying the feeling of having a whole mountain to ourselves, we turned back and began our descent to Red Rock Flat. It was now 2PM and we still had almost 5 miles to go to reach the camp. While it was all down hill, we were feeling the effects of the sun, the altitude, and the hours of hiking and I wanted to be sure to get across the last steep snow field before the sun dropped to far and the snow crusted over. We hoisted our packs and began down the trail. 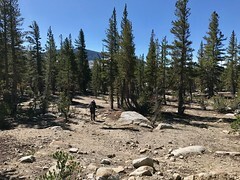 Since we were above tree line, we no longer had the cut branches of trail maintenance that I had grown a custom to following. It was up to my topo map skills to get us back to tree line (though I had a bit of help from the GPS of my iPone, which definitely came in handy). Descending was a nice change of pace, and the trail kept us on the sunny side of the ridge. Looking back we could see the trail we had been following stretching back along the mountain for miles. Crossing the last snow field and ducking back into the trees, we found ourselves less than a mile out of camp with a perfect view of the sun set. The colors were spectacular, and provided the perfect back drop for the cloud filled valley stretched out before us. We stopped to grab our headlamps and watch the day slip away. With the last of the light fading, we found our way into camp. We were on top of a ridge at about 10,000 feet, and as the sun disappeared, the wind picked up, the temperature dropped rapidly and what remained of my water started to freeze. We layered up, and quickly got the tent set up. My excitement for having a nice hot bowl of tuna rice was overshadowed by my desire to get into my fluffy down bag. Dinner turned into several handfuls of trail mix, jerky, cheese, and a few bites of summer sausage. 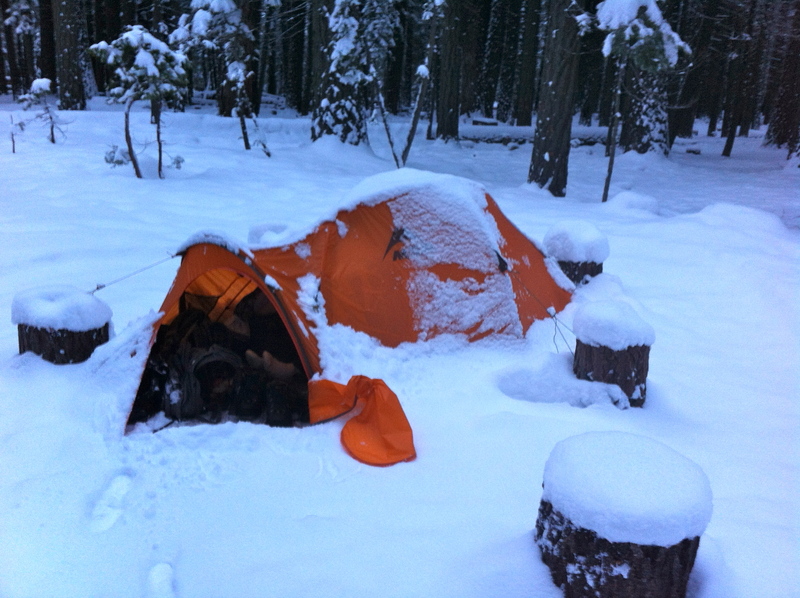 Once warm, Paul fired up a stove to melt a bit of water to get us through the night, and I piled up snow to help protect the tent from the wind gusting over the ridge. With the sun gone, and another night of new moon, it was pitch black out. But while building our snow wall, I noticed a strange orange glow on the horizon. I knew it couldn’t be the sun, that had set nearly an hour ago. Looking out into the dark I saw thousands of glowing points. 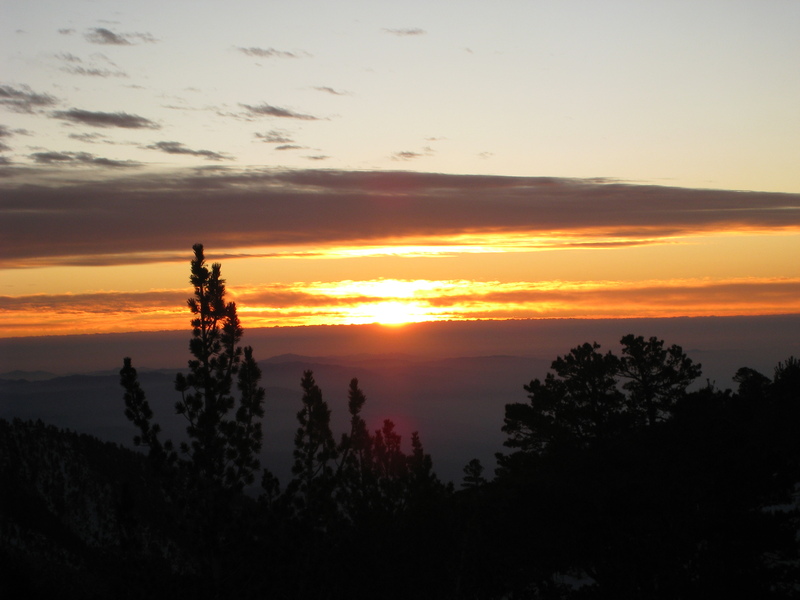 The clouds had cleared, and the lights of San Bernardino were now illuminating the sky. 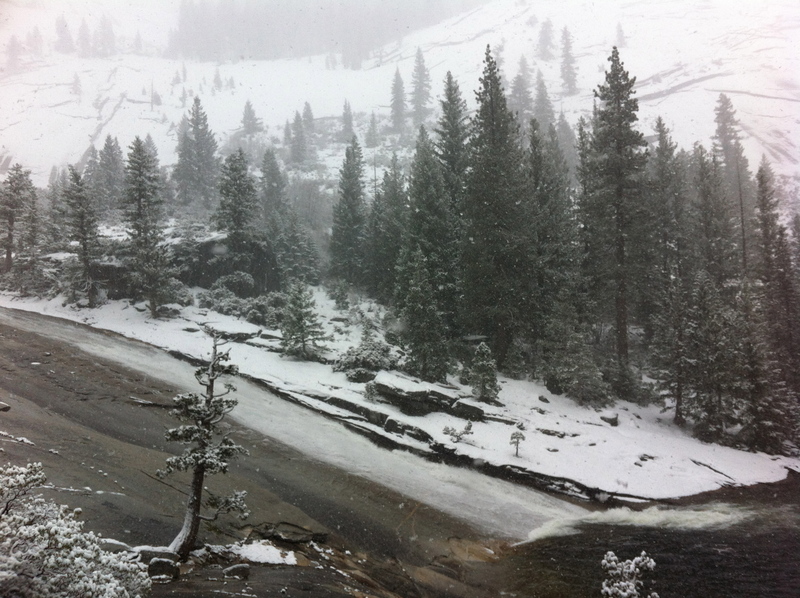 As isolated as the mountain had felt all day, it was hard to believe the city was so close.